Our guest today is Davide Cali, author of The Queen of the Frogs. 1. 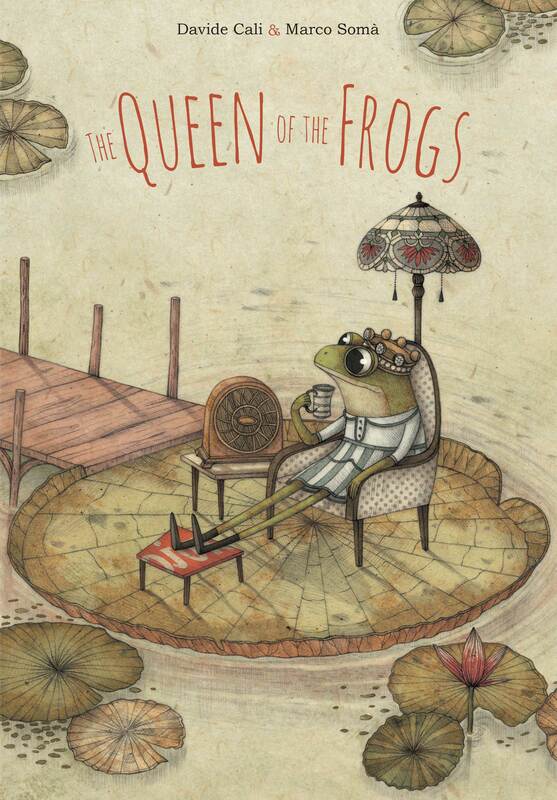 What inspired you to write The Queen of the Frogs? I can’t remember exactly. I wrote it about six or seven years ago. But, as you may know, I wear many silver rings myself and I buy some new ones wherever I go. I think I saw a ring shaped like a crown one day, and I starting imagining the whole story. But the crown, fallen down from the sky, is just a metaphor of something that is in front of us everyday: power changes things. And people too. I’m not against people having power, and some having more than others. But it’s something you have to deal with once you get it. 2. How did your collaboration with Marco Somà materialize, and what’s your process for working together? To tell the truth, we actually didn’t work so much together, me and Marco. I’m pretty used to following the illustrator step by step while he or she is working on a book of mine. We look at the storyboard together, then the colors test, and so on, until the end. When I asked Marco if he wanted to illustrate this story for me, we didn’t know each other. We only met later, after the book was published. So, I remember I was in Denmark at the time. After months I didn’t have any news from Marco, so I asked him if he had a storyboard, and he answered saying that he wasn’t too good at storyboarding. But had done “a couple of illios.” Then “a couple of illios” was the whole book. And it was amazing! It was simply perfect! It’s been one of those rare times when we didn’t have anything to change. 3. Can you describe the new book for us in verse—perhaps using a haiku, limerick, ballad, or other favorite poetic form? When none of us was even born. It could be in your backyard or mine. I’m reading Vita, a book by Melania G. Mazzucco about the Italian immigrants in America between the end of the 1800s and beginning of the 1900s. I wrote a picture book on this theme, so the illustrator I’m working with gave me this book she thought was an interesting reference. My parents have been immigrants too (that’s why I was born in Switzerland), and some others in the family as well. My grandma’s brother left Sicily for America in the early 1900s. So, it’s something that I like to read and to write on. I’m also reading a Le kiosquer de Charlie by Anaïs Ginori, a French book about the days of the attack on the Charlie Hebdo weekly magazine in Paris in 2015, and couple of editions of Hellboy. I’m a great fan of Mike Mignola’s comics. 5. What are you doing when you’re not writing (or answering questions for Eerdlings)? I spend most of my time traveling. I’m often invited to book fairs in France, and I do many writing workshops in Italy, so from September to July I’m around, meeting fans and children at school or giving lessons. I mostly travel in France, Italy, Belgium and Switzerland, then sometimes it’s Lisbon (Portugal) or Tallin (Estonia), Casablanca (Morocco) or Melbourne (Australia). I go to London when I need some days of rest. I actually write all the time, when I’m traveling too, so I can’t really say what I’m doing when I’m not writing. I’m also an art director for an agency based in London—but once again, after all, my work is about writing. And I play the guitar and . . . write songs. So, I guess that when I’m not writing I’m just sleeping. Davide Cali is a Swiss-born Italian author who lives in Italy. His work has been published in 25 countries and translated into many languages. He also writes under the pseudonyms Taro Miyazawa and Daikon.